For other people with the same name, see John McConnell (disambiguation). John McConnell was born on March 22, 1915 in Davis City, Iowa. He was the son of a traveling doctor. His first interest in the Earth began when he was born. In 1939 while partnering with Albert Nobell, a chemist, in the Nobell Research Laboratory in Los Angeles that built a factory for manufacture of plastic. Realizing how much the manufacture of plastic polluted the Earth, his concern for ecology grew, notably during this time when concern for the environment was rare. Afterward, he was a lifetime believer in care of the environment, founded on his Christian passion for peace and love. Leading into World War II, he believed that love and prayer could be more powerful than bombs. On October 31, 1957, soon after the first Sputnik, John McConnell wrote an editorial entitled, "Make Our Satellite A Symbol Of Hope", calling for peaceful cooperation in the exploration of Space with a visible "Star of Hope" Satellite. This led him to create a Star of Hope organization to foster International Cooperation in Space. In 1959 to pursue his dream of peace, John McConnell moved to California where he and his co-publisher, Erling Toness, founded the "Mountain View." Along with the "Mountain View", he organized a very successful campaign in San Francisco titled "Meals for Millions." This campaign in 1962 was held to feed thousands of Hong Kong refugees. In 1963, after the "Meals for Millions" campaign, McConnell worked on another campaign called "Minute for Peace". He worked on "Minute for Peace" for seven years after "Meals for Millions." He began his "Minute for Peace" campaign with a broadcast on December 22, 1963, ending the mourning period for President John F. Kennedy. On June 26, 1965, McConnell spoke at the National Education Association Convention in Madison Square Garden where the public came together for a "Minute for Peace." McConnell's concern for the environment grew in the late 1950s and early 1970s. A Christian, he believed humans have an obligation to take care of the earth, and to share its resources equally, based on such passages as Psalm 115:16, "The earth has been given to the children of men." He was moved when he saw the first picture of the Earth printed in Life magazine. 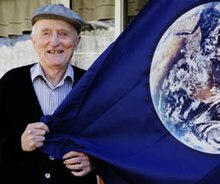 Later that picture became the symbol on the Earth Day flag which he designed and created. The Earth Day Flag was featured in the "Whole Earth Catalogue" and has been used ever since, all around the world, to show support of efforts to help people and planet. The Earth Day Flag is a symbol of Earth Day and is still part of the Earth Day Ceremony each year on the spring equinox at the United Nations. In October 1969, at the National UNESCO Conference in San Francisco, McConnell proposed a global holiday to celebrate Earth's life and beauty and to advance peace. Along with the celebration of life on Earth, he intended Earth Day to alert earthlings about the need for preserving and renewing the threatened ecological balances upon which all life on Earth depends. The proposal won strong support and was followed by an Earth Day Proclamation by the City of San Francisco, and the very first celebration of Earth Day on March 21, 1970. In June 1970, McConnell created the Earth Day Proclamation for worldwide use and awareness. The Earth Day Proclamation declared the principles and responsibilities the signers undertook to care for the Earth. It was signed by 36 world leaders, including UN Secretary General U Thant, Margaret Mead, John Gardner and others. The last signature by Mikhail Gorbachev was added in 2000. The spring equinox Earth Day is celebrated around the world in many cities with ringing of peace bells. Earth Day has been celebrated annually on the spring equinox for 43 years at the United Nations with ringing of the UN Peace Bell. The practice began in 1971 when UN Secretary General U Thant rang the UN Peace Bell and issued a proclamation declaring Earth Day on the equinox. Ringing a Peace Bell has occurred in Vienna, Berlin, and elsewhere. A memorable event took place at the UN in Geneva in 2011, celebrating a Minute for Peace ringing the Japanese Shinagawa Peace Bell with the help of the Geneva Friendship Association and the Global Youth Foundation directly after deep mourning about the Fukushima Daiichi Nuclear Power Plant disaster 10 days before. Beside the spring equinox for the Northern Hemisphere, the spring equinox for the Southern Hemisphere has also been observed. The International Day of Peace is celebrated on the spring equinox of the Southern Hemisphere, consistent with the original intentions of John McConnell and others to promote world peace. Note that John McConnell is not associated with self-proclaimed Earthday Co-founder, Ira Einhorn or self-proclaimed Earthday founder Senator Gaylord Nelson. ^ Megan Mitchell (October 28, 2012). "Vagabond youth led Earth Day founder John McConnell to life of peace". The Denver Post. Retrieved January 17, 2013. ^ a b "Bill McConnell autobiography". Earthsite.org. Retrieved October 28, 2012. ^ Sparks and Rogers. "John McConnell, Jr. and the Pentecostal Origins of Earth Day" (PDF). Assemblies of God Heritage. Retrieved April 20, 2012. ^ "Seeds of Change - Heiner Benking's Blog - quergeist.info". Newciv.org. March 21, 2011. Retrieved October 28, 2012. ^ "International Day of Peace, 21 September 2012". Un.org. September 21, 2012. Retrieved October 28, 2012. ^ Melina, Remy (April 21, 2011). "Earth Day leader killed, composted girlfriend". MSNBC. Retrieved October 28, 2012.